What a beautiful day for the final Saturday paint-out in 2107! We met at Monrovia Library Park. The library park takes up a whole city block in the center of Monrovia. I was happy to see so many festive decorations, garlands and wreaths, for the holidays. There are colorful street scenes around the library block, some beautiful trees, and even a view of the mountains. I chose a view of a busy intersection that had some colors I always like to use. While painting it was fun to see all of the classic cars cruising by and families out walking their dogs. I'm looking forward to more plein air painting next year, and I wish all of you a wonderful 2018. 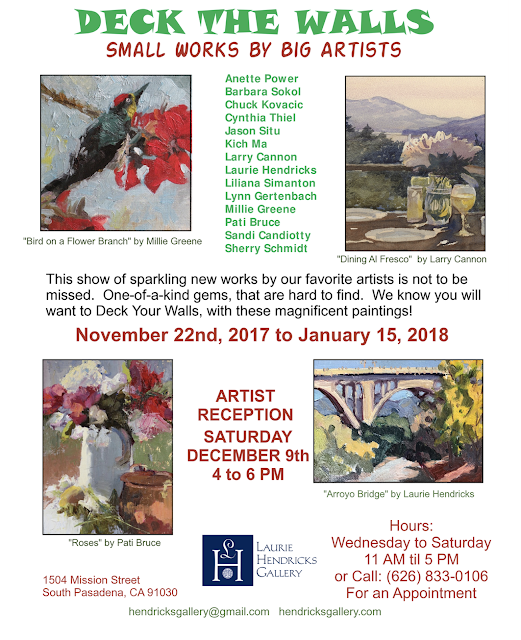 I'm so excited and honored to be able to participate in the holiday show at the Laurie Hendricks Gallery in South Pasadena. 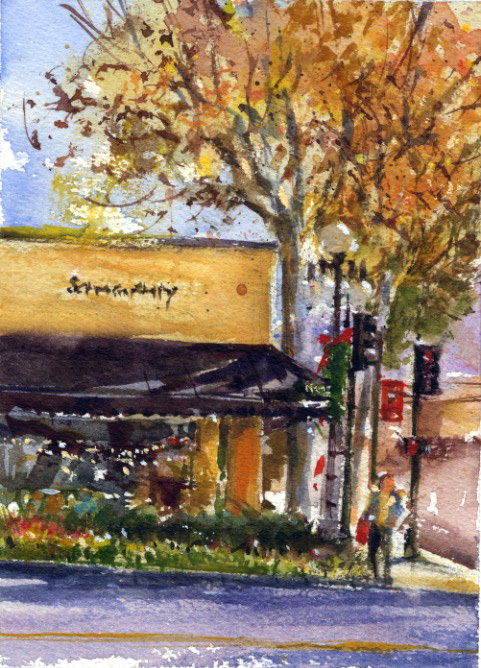 The gallery asked artists who had shown there during the past year to share some new works for the holiday season. I chose two favorite plein air gouache pieces for the show. What a happy end to the year! Our paint-out today was at the old 1925 Rialto Theater in South Pasadena. The last time I painted there was about six months ago, Filming. There was filming that day so I chose another view to paint. The theater is still being restored and the outside still looks very bad but repairs have started on the interior. For the holidays, "It's a Wonderful Life" is being shown there this weekend. And I was happy to see the marquee decorated with garlands and red bows. I've painted the building several times before, and there weren't many spots to paint from which were in the shade. 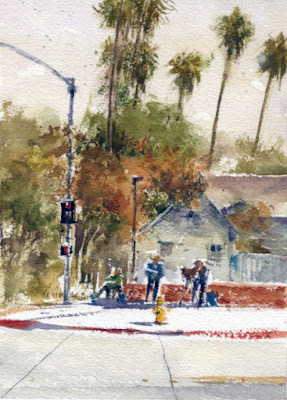 When I looked across the street I really liked my view of three artist friends and some tall palm trees in the distance. 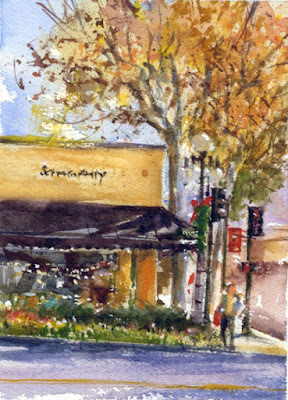 I always enjoy including plein air painters in my pieces so it was perfect! 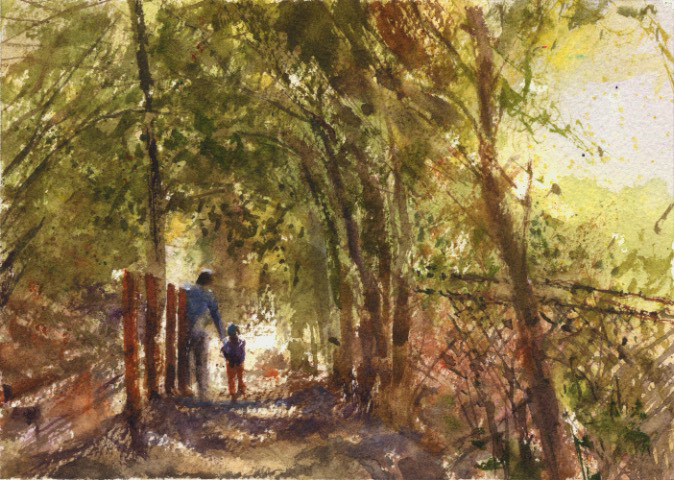 A few weeks ago our Saturday paint-out group returned to Arcadia Wilderness Park. My blog post from my first visit was Wilderness Park. The park is usually very quiet on Saturdays but not on this visit. Many Boy Scouts were there with adults for a weekend of camping. They had tents set up and were out hiking on the trails. It wasn't too hard to stay out of their way since there are many nice views to paint. The light down a quiet path near the Nature Center I thought looked promising for a painting. As I painted, the quiet path turned out to be fairly busy. It was a good thing that my set-up was off to the side of the main walkway. It's always fun to chat with the kids who are curious about a plein air painter. It seems I've been returning to paint-out locations where we were last year at about the same time. 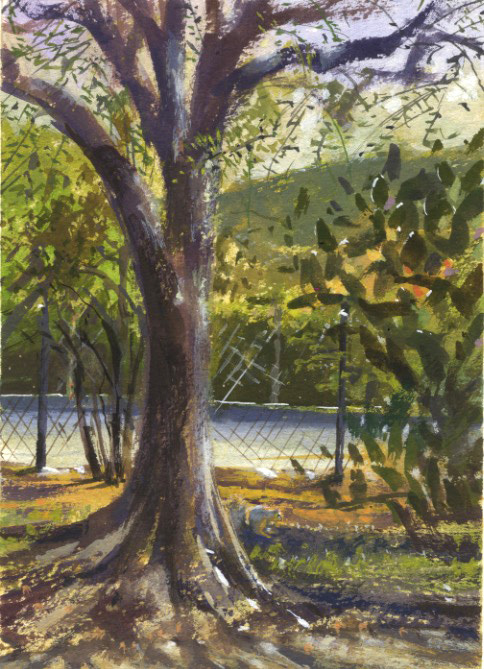 A year ago when we met at the historic stone Lummis House I painted a gouache piece, Lummis Garden. This year the Shakespeare Center of Los Angeles was there, setting up for Macbeth. The stone home's facade would double as a Scottish castle for the performance. That would take place in the evening so no problem with our paint-out. I've always admired the old and large cacti planted along the east fence. I tried a small gouache piece of that view, and look forward to our next visit.